Seinfeld is on, the one where Kramer gets a line in the Woody Allen movie shooting down the street. I just had to stop what I was watching, which incidentally was the first disk from the two Seinfeld box sets I got for Christmas. I arrived home this afternoon and decided I would watch a few episodes, as I didn't get a chance to see any while I was away. Anyway, I ended up watching the whole first season, suprisingly only four episodes. I think it's amazing how close Seinfeld came to never even getting off the ground to become the show that it was. Imagining a world without Seinfeld, I guess there would most likely be another show that would rise up to fill the Christmas stocking. When I was younger, sometime while I was still in high school - seems so long ago now - I remember I used to watch Seinfeld all the time. I would make sure I was at home every week night at 7pm so that I could tape every episode and whenever I got to the end of one five hour tape, I would start a new one. I ended up with about fourteen tapes that I would just play over and over again. There was even a short period where I couldn't fall asleep unless Seinfeld was playing in the background. There were some episodes that I didn't have on tape, the ones they didn't play or the ones I'd missed recording for whatever emergency. I hadn't seen the first season in a long, long time. It's strange watching these episodes; they seem so unfamiliar compared to the ones seen just about a hundred times before. oh my god -- i'd never considered it before! a world without seinfeld... too horrible to imagine! where would we all be now??? A world without Seinfeld would indeed be terrible, although in that world, we would have no knowledge of what extraordinary entertainment we would be missing. 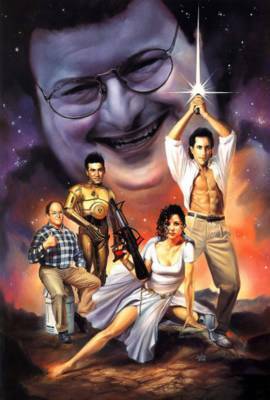 I wonder however, that amongst all the tv shows that don't get off the ground and all the pilots that are not picked up, that perhaps there would be a series that could even surpasses the qualities of Seinfeld and the vast majority of people would be totally ignorant of its existence. But then a friend said: if I had Alzheimer's, I might forget that I ever liked Seinfeld. The thought of this prospect is just too painful to bear!